This morning, Cody dropped Val, Connor, the dogs, and I off at the log dump before he went fishing. 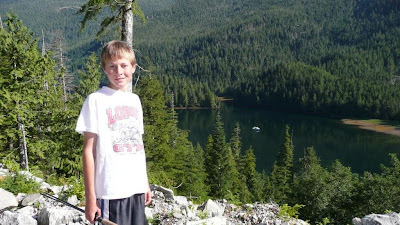 We hiked up the old logging skid road hoping to find Lake Alvin and some nice Rainbow Trout. We hiked for about an hour and half but kept running into overgrown logging trails. Bummer. Cody came back with one nice Rock Fish and one crab from the trap. 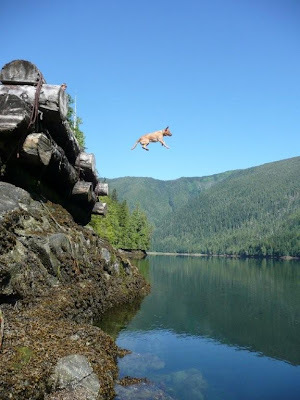 When he picked us up at the log dump, Tanner had nearly perfected his high diving routine. It was 11AM and the tide was almost out. From the water to the top of the log dump was 22’ and he dove off after his stick without hesitation time and time again. We couldn’t believe it and all laughed and laughed at him. By the time we got done with lunch and ready to cruise, it was noon; perfect for a slack water exit of Watts Narrows. By the time we got out of the narrows and on plane, it was about 12:30. We throttled up to 23 knots and didn’t shut down until 130 miles later. We were at our anchorage by 6PM; not a bad day. Even though there were gale warnings out, the wind was at our backs and we had smooth sailing for the most part. We took just a bit of spray but never had to throttle back once. Val had a lovely Crab Carbonara ready for dinner. Yum. After dinner, the boys and Tanner went off exploring/fishing. Val cleaned up the inside and I washed the salt spray off the boat. It was really warm today…it hit 78 but it felt a lot warmer. There hasn’t been any bugs, either….which is really nice. Alaska had a lot of little bugs. How’s your summer going? Send me a note! I haven’t heard nearly enough from you lately.